Discussion in 'Video Games' started by JohnnyP123456, Aug 4, 2016. The player and team ratings have been released today. Apparently we are the 2nd worst team in the AFC. And millions of people will buy it leaving EA once again unlikely to make any real changes to the game. Super Mario World is available for NES too bro. They did seem to upgrade franchise mode a lot and add some more features. The gameplay is somewhat different with better running controls. I always liked ESPN 2k football games. Far superior gameplay back in the day IMO. But Madden is still great and incredibly deep. At least they moved up from being the worst. That was their original ranking in this year's Madden. It's still complete nonsense. But Sam Darnold becomes the truth in real life and the Jets then become one of the Madden Franchise teams for the 1st time ever. Watch. Sam Darnold gets respect in real life and Jet players such as Robby Anderson, Jermaine Kearse, Terrell Pryor, Quincy Enunwa and Isaiah Crowell all skyrocket in Madden rating due to Darnold making them more deadly in real life and on defense players like Jamal Adams, Leonard Williams, Trumaine Johnson, Darron Lee, Marcus Maye and Morris Claiborne all then become Madden household names for NY. Although haven't played in a couple seasons I've loved Madden dating back to 1992 on Super Nintendo. Back when Barry Sanders was #20 & Michael Irving #88 (no player names) and one thing I've always noticed and taken note of; teams without a sure fire Franchise QB never ever gets true love through the eyes of Madden. I've always told myself. I'll never be able to truly compete (online) with my Jets on Madden until we truly have a great QB. I could only stomach using my slow Jets online against the likes of Seattle, N.E & Green Bay for so long before getting frustrated and switching to Ben Roethlisberger & the Steelers myself. Because I knew my style of play & game calling ability (on both sides) were better than most these opponents I played and suddenly. My Pittsburgh role players become way more effective than that of NYJ's for me. Even our Jets playbook has always been vanilla on there (imo). Sam Darnold becomes the truth in real life? I'm going to get a PS4 & Madden again. I've dreamed of a top 5 Madden team since a kid even in 2009 & 2010 we were crapped on because Sanchez our offenses always stunk on there and I guess rightfully so. Yes. 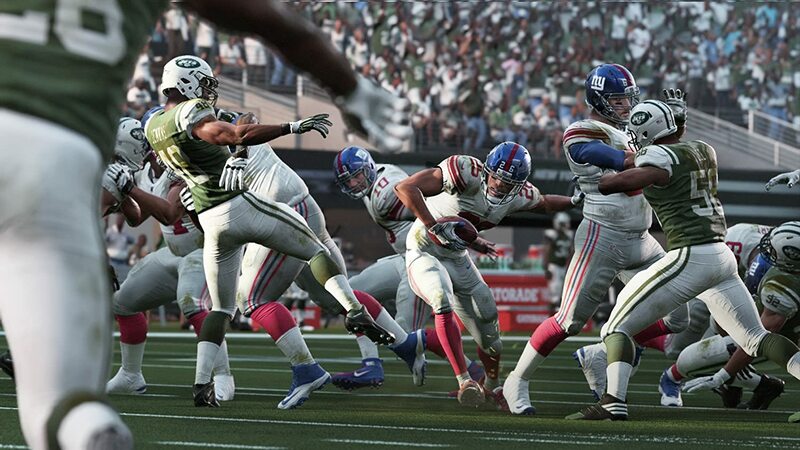 Sam Darnold is our only Madden hope. I see the Jaguars are an exception to the Madden rule though. QB Bortles is only rated 80 but they are stacked as a top 5 team and on defense they are fire power with 10 starters rated 83 or higher and two shut down CBs in Ramsey (97) and Bouye (94). The perfect team to ground and pound Fournette with & and play strong defense. They'd be deadly with a QB.